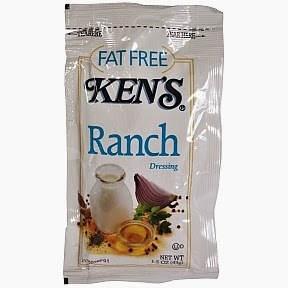 I eat a lot of salad, and up until the last few years, I had no idea that my "low-fat" dressing was actually doing more harm than good. I thought I was doing so well. I would even use coupons to get my dressing for next to nothing. Double win! (I thought). This was a huge game-changer for me in our real food journey. Trans-fat (bad fats) like canola, soybean, and cottonseed oil. Not only are they most likely GMO, the process at which they were made causes them to become rancid, which is very hard on our bodies and just flat out unhealthy. water, buttermilk, vinegar, maltodextrin, sugar, salt, cellulose gel and cellulose gum, contains less than 2% of: garlic, carrageenan, xanthan gum, titanium dioxide, sour cream solids, monosodium glutamate, potassium sorbate, sorbic acid and calcium disodium edta as preservatives, spices, lactic acid, citric acid, natural flavor. Pa-lease throw out your fat-free or low-fat dressing. There’s nothing good in it for ya. And as you can see, I didn't even include the "nutrition facts." Those don't even matter if what you're eating has harmful ingredients. Fat helps you absorb vitamins and minerals, so that big fat salad may not have been doing a whole lot of good if you do not have a healthy fat thrown in there. So here's the dressing we've been obsessed with for a while. It's not exactly gourmet, but its simple, inexpensive and delish. The ingredients are all things you probably have in your kitchen (and if not, you should because you can use them for so many "real food" dishes). A friend of mine that made this said she's never eating store bought dressing again because this just tastes so much better! Shake in a jar, and keep in the refrigerator. Play around with ingredients until you get the taste you like—some people like it more sweet than others. This is a recipe that is better made right before-hand, but if you want to make a head of time and put in the refridgerator for a week or so it's fine too. (but you will need pull it out ahead of time or put in a bowl of warm water to un-solidify the olive oil).